This quilt was for my Dad, the enginer. My sister made the top and I quilted it. 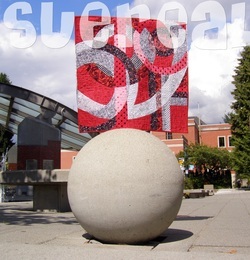 This quilt was for my Mom, the Artist. I made the top, my sister Kim quilted it. For our parent's 50th anniversary my sister and I made them each a quilt that was inspired by their personalities. My dad is an engineer by trade and temperament. My mom is an artist by nature. Since my sister is an engineer, she designed my father's. I designed my mom's. Once the tops were made, we switched them and quilted each others quilts. 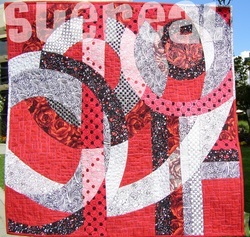 I created this quilt for a challenge that is run by a quilt catalogue in the USA They supplied most of the fabrics. I got the idea for this off of a takeout container from my favo Mexican restaurant. I gave it to my sister for her birthday. I made this wall hanging to play around with all the silk shirts that I have scooped up through the years for a dollar or so. The main body of the squid is a bit of a sari that someone gave me. I used the iron on applique method. I also used iron on for the foil highlights. More detail was added with colored pencils. 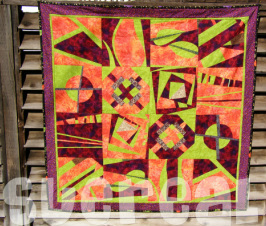 Since the silk is older, I quilted it very heavily to help to stabilize it. 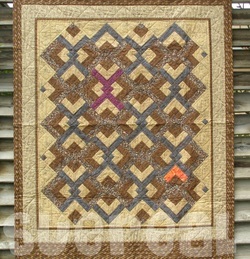 I used rayon and metallics threads to quilt.